Quoting commercial group health insurance policies is a complex endeavor in today’s health plans. Unlike Medicare or an individual or family policy, where benefits are pre-defined and quoting is usually a simple matter of referring to rates based on locality or age cohort of the individual(s) to be insured, group quotes are complicated. From start to finish, they can take up to a week just to gather the information and prepare the quote. The standard tools are not up to the challenge of providing many quotes per day during the busy season, yet health insurance providers have idle time in the off-season because volumes are low. Could they put their time to better use by pre-configuring their network and underwriting data during the off-season so that they could provide quoting on-demand during the busy season? The answer is a definitive “YES” with Quote-to-Cash solutions like Salesforce CPQ integrated into your Salesforce Sales Cloud. In this article, we’ll first explain the problems haunting the typical process behind group quote generation; then we’ll delve into a better, simpler solution with Salesforce CPQ; and finally, we’ll examine the benefits from integrating with Quote-to-Cash solutions. 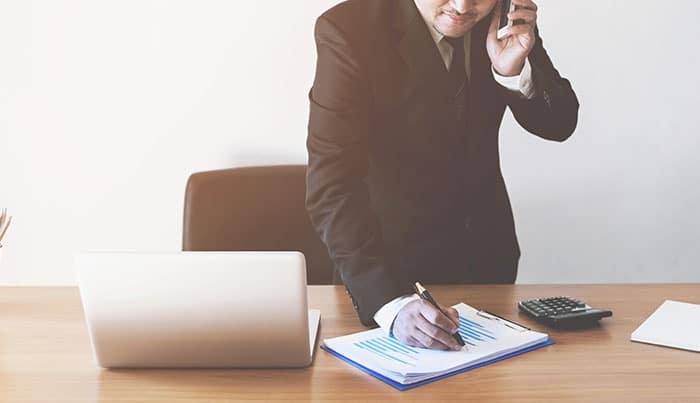 Typically, an appointed, independent Agent of Record (AOR), who works with the business on their insurance needs, will start the process by contacting an in-house agent at the health plan provider for a quote. Working together, they will gather the group census demographics and required information about pre-existing conditions that could affect the quote. Next, the in-house agent will prepare documents for the internal underwriting and pricing teams, that often includes different individuals and teams to represent different network models (HMO, PPO, EPO) and benefit types (medical, dental, vision, pharmacy) for underwriting analysis and pricing. Upon completion of these analyses, the information is bundled back together into a quote document that can take up to a day to prepare. Next, a round of approvals may take a day or two. During the hectic fourth quarter, these teams scramble to generate hundreds of quotes for businesses as large as 10,000 and as small as three covered lives. Even when simplified, the group policy quoting process is still complex and arduous. 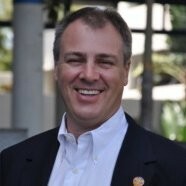 The process is so complicated because of the outdated nature of the tools used in process—we are currently working with a plan with nearly 1,000,000 covered lives, that is part of a massive multi-state integrated health system with dozens of hospitals and thousands of providers who still use spreadsheets and standalone databases to manage underwriting and pricing data. Using QTC, also called CPQ, Applications, your health plan can build integrated network modeling and underwriting tools up to the challenge of ‘jet issue’ of quotes. Your tools will be able to provide the AOR with quotes within minutes of entering census and pre-existing condition information into the Quoting Portal Application. So, how does it work so fast? During the setup of the QTC tool, your network, underwriting, and pricing specialists will work with Simplus to identify and define the discrete elements of their decision processes. We then develop the data framework and complex logic tools that replicate their process in the QTC application. When an AOR logs into your secure Agent Community, powered by Salesforce Communities, they access the QTC applications directly as a user. Using simplified upload tools, they upload templates completed by their customer into the system and define the quote parameters such as network configuration, pricing variables, and other information into the CRM. In the Sales Cloud, the new opportunity is automatically created, and the quote is prepared. If reviews and approvals are necessary, the underwriters and managers are automatically notified of their tasks and provided with QTC views and reports to simplify their analysis of the quote and allow them to complete the job assigned quickly. No longer will they be required to labor to create reports with incomplete data, only to realize that the request is incomplete or doesn’t meet other requirements. Validations are performed during the intake process performed by the AOR on the Community App and rejected with details to enable the proper completion of the application. Not only does this trim days off the quoting process, but it puts delays on the AOR, reducing quote turnaround time by starting the clock only when a quote application is valid and complete. Within minutes or hours—not days or weeks—you have provided an authorized, underwritten, and approved pricing quote to the AOR, who can present it to his client with the same impressive speed. As a health insurance company competing for large contracts, this represents a substantial competitive advantage and impresses the end client with your commitment to handling business quickly and efficiently. 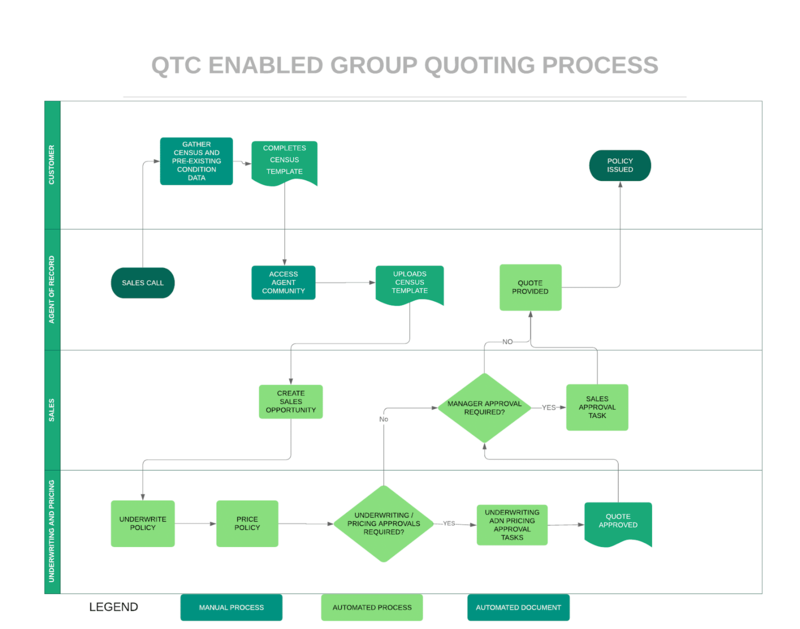 QTC simplifies Group Quoting by automating many tasks shown in light green. 1. Smoothing Annual Workload: Underwriting and Pricing Experts can focus on the preparation of quotes throughout the year by working on the configuration of the QTC tools to get ready for the heavy quoting season during the fall. This can reduce staffing requirements— a direct cost saving—and also lead to greater job satisfaction. During the busy season, these experts can work on exceptions and analyze the process for further improvements, rather than be worked to death by unreasonable workloads that lead to burn-out. 2. Quality Underwriting: Using QTC, the sales and underwriting teams can focus on what is really important in the health insurance sales process: making good business decisions. Because much of the workload is automated, the emphasis can be on winning good business and making strategic decisions that increase the health plan’s book of business without the sacrifice of taking dangerous risks. Quote revisions on competitive bids can be analyzed, and better decisions will result. QTC can help your health insurance plan become more competitive and put the best foot forward to win business during the all-important busy season. As you consider your next busy seasons, keep in mind that a long-term investment in QTC will pay dividends for you and your health plan for years to come.